Macular degeneration is the leading form of legal blindness and severe vision loss in Australia, responsible for over 50 percent of all blindness. The macula is the central part of the retina, the light sensitive tissue at the back of the eye. It is responsible for all our fine detailed sight that is used for reading and driving. Macular degeneration generally occurs due to ageing changes at the macula, which lead to deterioration of our central vision. The retinal pigment epithelium (RPE) resembles a wall, and is responsible for passing oxygen, sugar and other essentials to the retina. It also moves waste products away. Early stages of macular degeneration are observed when waste products from the retina build up beneath the RPE. This forms yellow deposits, called drusen. An eye test that checks the macula is vital, as drusen can build up un-noticed. Our expert optometrist, Paul Fotkou, will examine the back of your eye for drusen using specialist optometric equipment. Small amounts of drusen do not necessarily cause visual symptoms, and not everyone with it will experience vision loss. However, its existence does increase the chance of macular degeneration associated vision loss developing later. 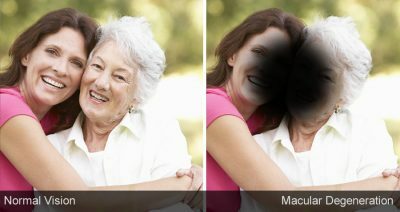 The later stages of macular degeneration cause loss of vision. This is due to RPE cells dying, or failing to prevent blood vessels from growing under the retina. When RPE cells die, retinal cells above them also die, leading to patches of ‘missing retina’. This is known as dry macular degeneration – a slow form of the disease that causes a gradual loss of vision. It is responsible for one third of all cases of macular degeneration. Those with dry macular degeneration can further develop the second form, wet macular degeneration. This occurs when RPE cells fail to stop choroidal blood vessels from growing under the retina. These rapidly growing vessels are fragile and ooze blood under the retina, causing scarring and severe loss of central vision. Wet macular degeneration is both sudden and severe. Approximately 21,000 new cases are diagnosed annually in Australia. The three greatest risk factors of macular degeneration are age, family history and smoking. Those with a direct family history have a 50 percent change of developing the disease. 70 percent of cases have a genetic link, therefore it is important to inform siblings and children if you have been diagnosed with it. Smokers are up to four times more likely to develop macular degeneration. It may also develop at a younger age than in non-smokers. As drusen can build up unknowingly, it is detected through an eye test with an eye care professional. Therefore, it is vital to have regular eye and macula tests with an optometrist. Paul Fotkou uses Optical Coherence Tomography (OCT). An OCT is the industry standard in the diagnosis and management of macular degeneration. The scan produces high resolution, cross-sectional images of the tissue layers within the retina. This technology is exemplified in the video. Comparing such images over the years allows for changes in your eyes to be identified and monitored. As dry macular degeneration can turn into the wet form rapidly, you should immediately inform an eye care professional of any vision changes. There is currently no medical treatment available for dry macular degeneration. However, there is a substantial amount of research being conducted. Progression of the disease can be slowed with positive diet and lifestyle choices, as recommended by the Macular Disease Foundation. Medical treatments are available for wet macular degeneration; while they do not cure the disease, they aim to stabilise and maintain vision. In some cases, treatment can improve vision. For regular testing, more information or further management options, book a comprehensive eye test with Paul Fotkou.